3x Duo Spirulin - Natural dermocosmetics and dietary supplements. Collagen creams. It is a natural immunity enhancer, which provides strength and energy for each day. Strength and energy from ocean depths. Spirulina and chlorella – are a source of natural antioxidants, which protect a body against oxidative stress. Spirulina provides vital strength (reduces the feeling of fatigue), enhances immune system as well as maintains a proper level of glucose in blood. Chlorella gives energy and takes care of your liver. Vitamin C – maintains proper energy metabolism and functioning of nervous system, immunity, as well as psychological functions. 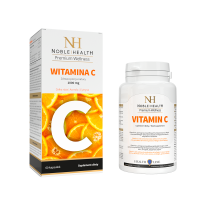 Vitamin C and E – helps protect cells from free radicals (protection against oxidative stress). Vitamin A – affects eyesight and functioning of immune system. Vitamin D – plays a vital role in the functioning of muscles and immune system. Zinc – supports proper protein synthesis, maintaining your skin, hair, nails in good condition. Selenium and zinc – help maintain healthy and shiny hair, as well as support proper functioning of immune system. 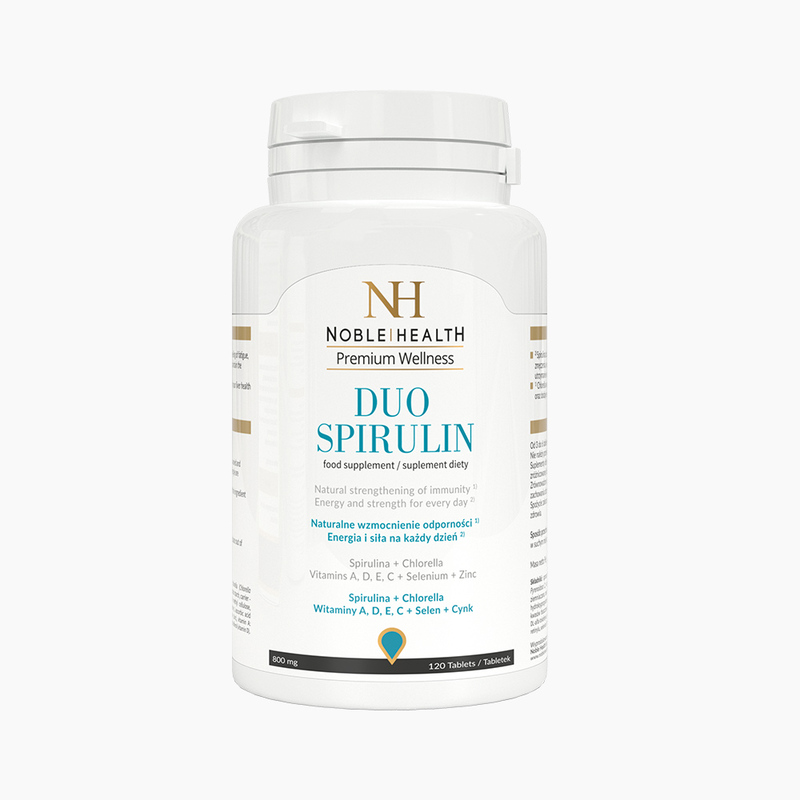 1. Who should use the Duo Spirulin product? Duo Spirulin is a food supplement which contains unique combination of spirulina and chlorella algae as well as vitamins and minerals. These ingredients ensure better immunity and protection of a body, maintaining good health and better well-being. 2. What are the ingredients of the Duo Spirulin product? 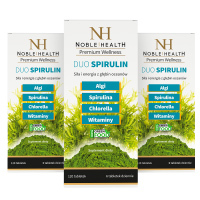 Ingredients of Duo Spirulin: powdered algae: spirulina (Spirulina Platensis), chlorella (Chlorella Pyrenoidosa C.); anti-caking agent – microcrystalline cellulose, potato starch, sodium carboxymethyl cellulose, emulsifier – hydroxypropyl methylcellulose, anti-caking agents: magnesium salts of fatty acids, silicone dioxide; L-ascorbic acid (vitamin C), DL-alpha-tocopheryl acetate (vitamin E), zinc oxide (zinc), Vitamin A: beta-carotene, retinyl acetate; sodium selenate (VI), Cholecalciferol (vitamin D). 3. How does the ingredients of Duo Spirulin work? Duo Spirulin is a set of active ingredients, which support the functioning of immune system. 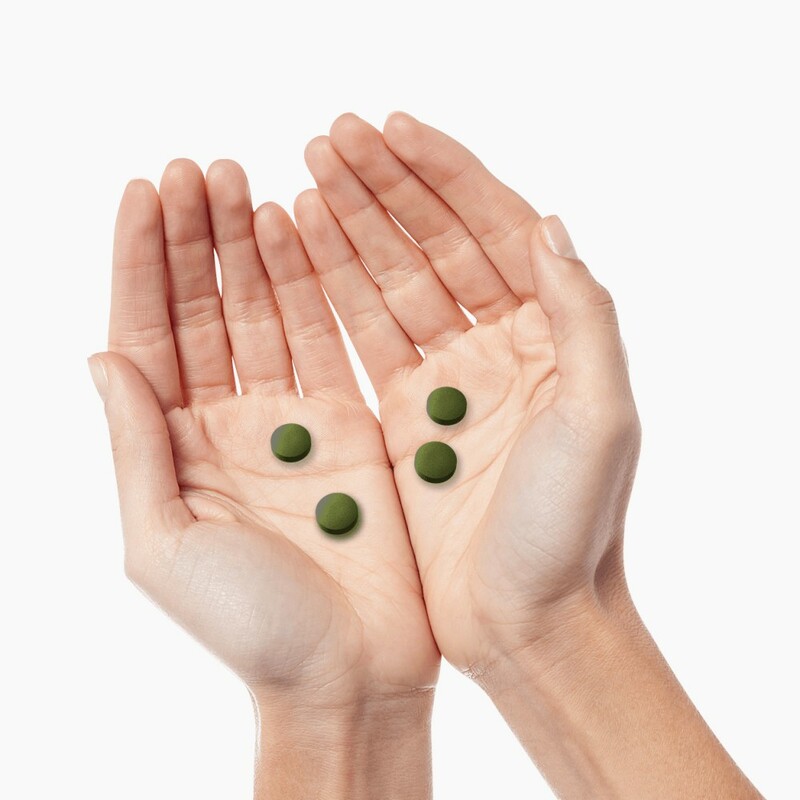 This food supplement combines positive effects of sea algae: spirulina, which is responsible for proper blood glucose levels, and chlorella, which maintains vital strength. Vitamins contained in the product positively affect the proper functioning of immune system (vitamin C), protects cells from oxidative stress (vitamins C and E), and maintain proper eyesight (vitamin A). Additionally, minerals contained within the product help maintain healthy hair and nails (zinc, selenium). 4. How to use Duo Spirulin? You need to take 3-6 tablets per day, depending on your needs. You should not exceed the recommended daily dose. The food supplement cannot be used as a substitute for a varied diet. A balanced diet and a healthy lifestyle are essential to a good health condition. The recommended daily dose guarantees positive benefits to your health. 5. How to store Duo Spirulin? Duo Spirulin should be stored at room temperature, in a dry place. Keep away from small children. 6. How many tablets are in one Duo Spirulin package? One package of Duo Spirulin contains 120 tablets. 7. Does Duo Spirulin contain allergens? Duo Spirulin is free of allergens. 8. 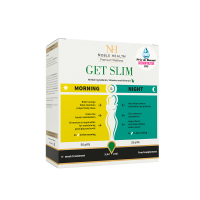 What is the net weight of Duo Spirulin? 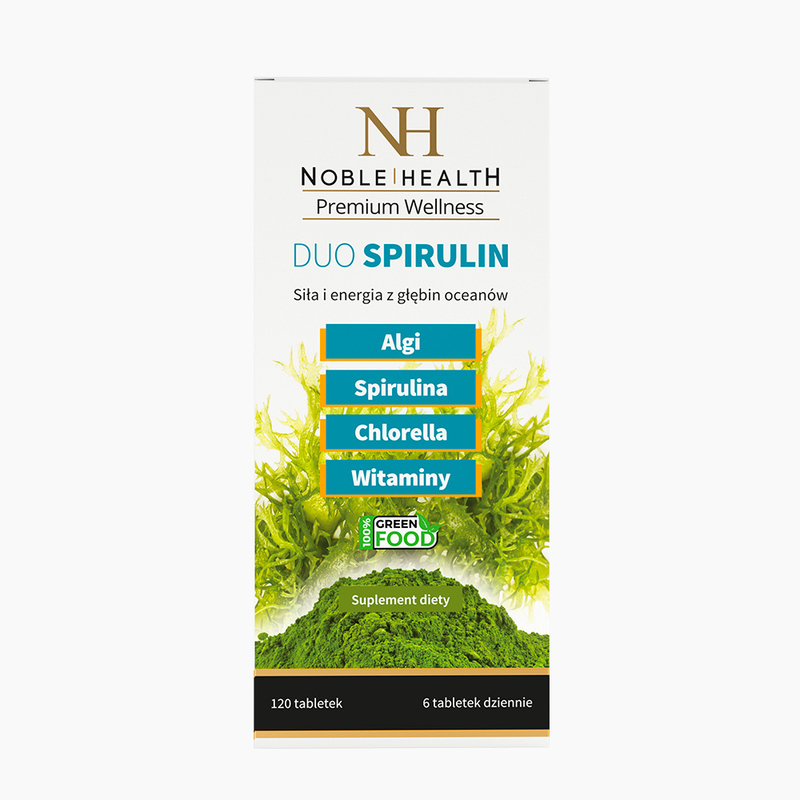 Net weight of Duo Spirulin is 96 g.
I recommend this awesome spirulina with chlorella. The results are visible after 3 months. Since I regularly use Duo Spirulin I hardly ever get sick so I recommend to others. 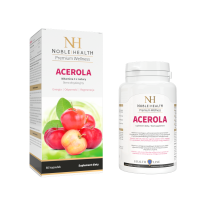 A great product, spirulina and chlorella as well as vitamins and minerals to strengthen the immune system, helping to maintain health and well-being. So it is definitly worthed to carry out such treatment. This is my absolute HIT. I'm happy you have introduced the kits option. One I give to my mother, she also praises it. The enhancement effect really WORKS and after 3 weeks I felt I could move the mountains!